Your approach takes you closer to the planet. A red star shines in the distance. As you watch the Earth floating in space, you think that you can almost see it turning on its axis. With a mind of its own, your finger reaches out to flick the sphere into motion. With a shock, the infinite depths of the universe collapse down to the confines of your work room as you snap back to reality. The red star is actually the LED on a nearby power supply. Maybe you were daydreaming, but the globe of the earth still floats on top of your workbench. What a conversation piece! What kind of device are we talking about here? What could make a mini Earth float in mid air? 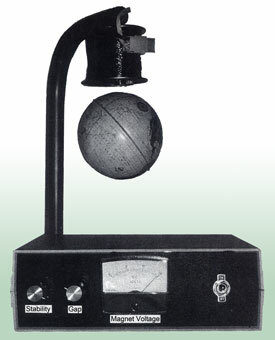 The Magnetic Ball Levitator described in this article, that's what. It's an educational project that will teach you all about closed-loop control systems as you build it. Forget complicated math or diagrams — we'll deal with the systems in a hands-on kind of way. You might have read articles or even books on closed-loop controllers in the past, but if you're like most, you've found that those theory-only discussions do little more than frustrate the reader. To learn about concepts like instability and feedback, you're best off actually experiencing them at work, So read on. Some other great reasons to build the Levitator are that it is cheap to build and does not contain any hard-to-find parts. You probably already have on hand most of the parts that you need to build it. And even if you don't you should be able to get a trimmed-down unit up and running for between $10 and $20. To do that you would need to skip the fancy case, eliminate the magnet voltage meter, and run the Levitator with a benchtop power supply.